At least eight people have been killed by an explosion in the Pakistani city of Lahore, officials say. The blast, which ripped through a shopping area, injured dozens more. Initial reports suggested an electricity generator exploded, but police later said that it may have been a bomb. Pakistan has been hit by a wave of bombings claimed by Islamist militant groups in recent days. There was no immediate claim for the latest blast. It happened in Lahore's Defence Housing Authority suburb. Television footage showed buildings, cars and motorbikes damaged by the explosion. The provincial Counter-Terrorism Department (CTD) said that investigators had found traces of explosive material at the site and were trying to establish how and why it was in the building. 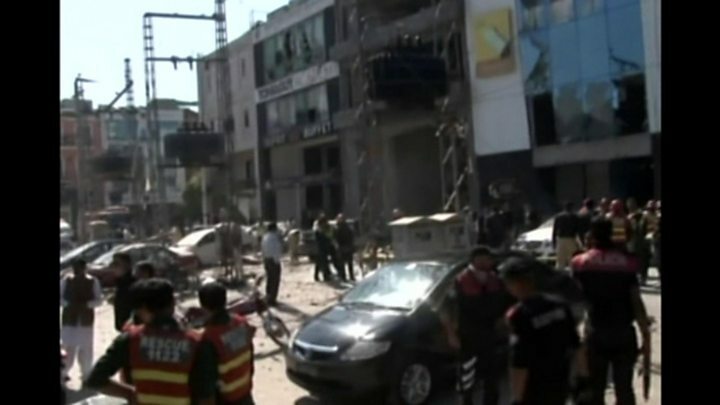 Local police chief Haider Ashraf said the blast was in an area that was under construction, adding that work was being carried out by staff at the time. "Our focus at the moment is to rush the victims to hospitals and secure the scene," Mr Ashraf said shortly after the incident on Thursday. One witness, Asif, said he saw people lying on the ground before police and security officers arrived. "As I am not a doctor, it was difficult to tell how many were wounded and how many were dead. But they were many," Asif said. Last week a Taliban faction said it carried out a bomb attack in Lahore, which killed 13 people and wounded more than 80. Days later a suicide bomb attack at a shrine in the southern town of Sehwan was claimed by the so-called Islamic State (IS). Police now say 90 people were killed. In response, Pakistan launched a security crackdown, which included closing border crossings with Afghanistan, and claims it killed 100 militants.